↑ Stella, Gian Antonio (14 March 2013). "Tango e battesimo, fidanzata e vangelo l'alfabeto misto di Papa Francesco" (Italianमे). Corriere della Sera. http://www.corriere.it/esteri/speciali/2013/conclave/notizie/14-mar-papa-tango-fidanzata_1069e952-8c70-11e2-ab2c-711cc67f5f67.shtml. अन्तिम पहुँच तिथि: 14 March 2013. "Mio padre era di Portacomaro (Asti, ndr) e mia madre di Buenos Aires, con sangue piemontese e genovese"
↑ Rice-Oxley, Mark (13 March 2013). "Pope Francis: the humble pontiff with practical approach to poverty". The Guardian (UK). http://www.guardian.co.uk/world/2013/mar/13/jorge-mario-bergoglio-pope-poverty. अन्तिम पहुँच तिथि: 13 March 2013. ↑ Donovan, Jeffrey (13 March 2013). "Argentina's Cardinal Bergoglio Is Elected Pope Francis". Bloomberg. 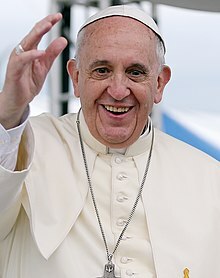 http://www.bloomberg.com/news/2013-03-13/argentina-s-cardinal-jorge-bergoglio-is-elected-pope-francis-i.html. अन्तिम पहुँच तिथि: 13 March 2013. ↑ Barney Henderson (14 March 2013). "Pope Francis elected leader of Catholic Church: latest". The Daily Telegraph. http://www.telegraph.co.uk/news/religion/the-pope/9928921/Pope-Francis-elected-leader-of-Catholic-Church-live.html. अन्तिम पहुँच तिथि: 14 March 2013.